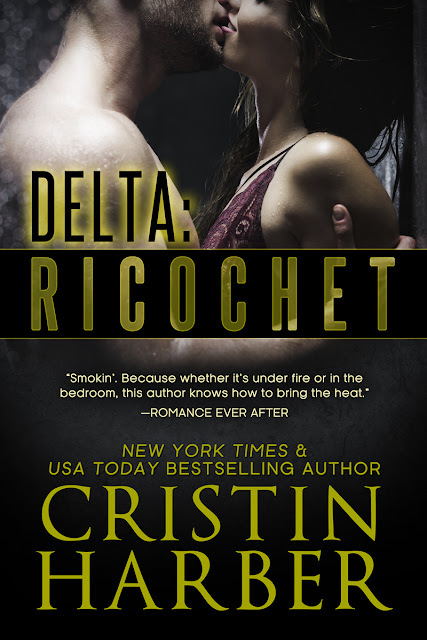 We are so thrilled to share the cover of DELTA: RICOCHET by Cristin Harber with you! DELTA: RICOCHET releases February 27th - make sure you preorder your copy today! From New York Times Bestseller Cristin Harber of the Titan series comes a new standalone romantic suspense novel. Colin questioned his recruitment to Delta team from day one, but he's made sure to earn his accomplishments twice over. No one could accuse his diplomat father of pulling strings. Falling for Adelia is everything he never planned and always wanted. No complications. No agenda. Just a sweet girl who made him smile. But Adelia has spun a network of lies around the world to help save women from human traffickers, and she's stolen from Mayhem motorcycle club, the men who saved her life, to do it. Anonymous friends back her unseen good deeds—until a link snaps. Actions have consequences in the Mayhem MC world. The repercussions are deadly. Everywhere she turns, the fallout ripples. Friends become enemies. Family walks away. There's no one left to save her except for the man she's fallen in love with, and she'd do anything to keep him from Mayhem's ricochet. DELTA: RICOCHET is a standalone military romance / romantic suspense novel. It features characters from the Titan, Delta, and Only series, but new readers will enjoy this book without a problem. There's a guaranteed happily ever after and absolutely no cliffhanger! Preorder DELTA: RICOCHET – available February 27th! Add DELTA: RICOCHET to Goodreads!